A couple of weeks ago, on Miguel’s recommendation, we visited Granada. Granada was the last Moorish kingdom to hold out against the Christian monarchs (los Reyes Católicos) and this Moorish heritage permeates the city. Nowhere is it more apparent than in the Alhambra, a massive fortress built on a hill above the city. We stayed in the great Migueletes Hotel which is located in the old Moorish Albaicín quarter. This is a UNESCO World Heritage Site and is a maze of tiny winding cobbled streets on the north side of the Alhambra. The church of San Nicolás is located here and its square provides a stunning view of the Alhambra with the Sierra Nevada in the background. It’s fun to wander around these atmospheric streets where places like the lovely Plaza de San Miguel Bajo even have nice Coca-Cola signs. It was in the Albaicín that we first noticed some interesting graffiti. 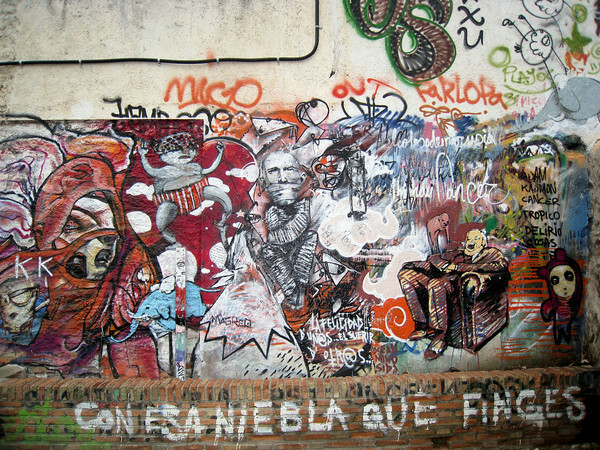 Apparently Granada is quite well known for its graffiti murals with the artist known as el niño de las pinturas being the most famous. I guess he’s kind of like a Spanish Banksy. Someone has even written a fifteen thousand word dissertation on him. Granada is a nice little city and well worth spending a couple of days in. Of course the Alhambra is the most obvious thing to see but there are plenty of other things to keep you occupied and Granada is one of the last places in Spain that still serves free tapas. I recommend the jamon y pimiento at Bodegas Castañeda on Almirecero!